Some of the witnesses who are now testifying in the Trial already testified in PREtrial and their Trial testimonies are the same in substance as their PREtrial testimonies. 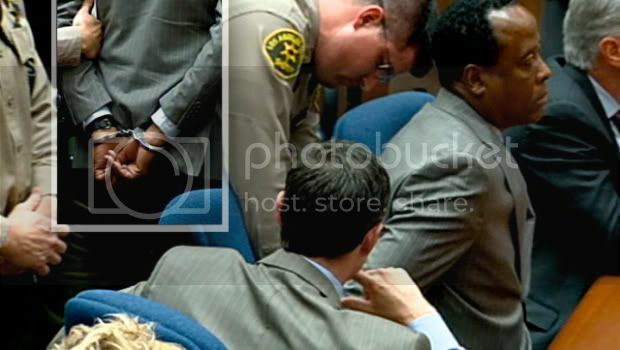 Jamie Lintemoot testified on January 7, 2011 in regads to the LA Coroner’s toxicology findings. The following is my notes of her PREtrial testimony based on the official court transcripts. 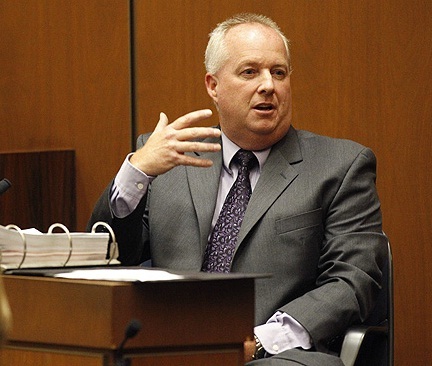 In Conrad Murray Trial, Dan Anderson, Jamie Lintemoot’s supervisor testified pertaining to the Coroner’s Toxicology findings. Under my notes for Mr Anderson’s testimony, you will find info NOT included in Jamie Lintemoot’s testimony. After she received a service request for Propofol testing, she pulls the samples from the toxicological cooler. She notes the information from the sample bottle so chain of custody is maintained. Then she perform an “extraction” = “chemical steps to isolate the drug into a medium that is suitable for analysis” Then she places it on drug detective instrument and she will leave it there overnight. The next day, she will evaluate the levels contained on that particular sample. Why are the ratios in femoral and heart different? Different drugs, different specimen sources and post-mortem redistribution. After someone dies, the drugs can leak out into other tissues, thus, change the levels. The ratio to Lidocaine to Propofol is 12 to 1. For the first time, lidocaine levels are higher than Propofol levels in stomach than in any other samples. She analyzed the syringe barrel (recovered from the nightstand next to bed) but she didn’t analyze the needle (recovered from the floor). She didn’t try to put together the 2 detached pieces. Mr. Anderson where r u employed? You indicated ur current position as a supervising criminalist, what is that? And does part of that testing process involve performing what’s known as an extraction? It sounds like isolating what will actually be used with the instrument to test? These instruments are scientific drug detection instruments? Did ur laboratory perform biological testing as it relates to this case involving decedent Michael Jackson? In the process of conducting biological testing in this case, did u take blood vials that had been recovered from coroner’s investigator Elissa Fleak from UCLA and include those as part of your testing? The biological testing of the specimens would include both what was recovered from UCLA and hand-delivered to you by Elissa Fleak as well as what was obtained as a result of the autopsy in this case? As far as analytical tool, analyzing the urine is more valuable than the blood? Urine reflects what has gone thru the body and is now expelled from the body? 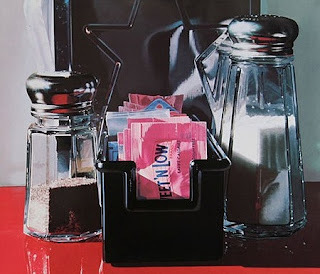 To given an idea as to the amounts of Propofol and Lidocaine found in Michael Jackson stomach, Mr. Davidson used a 1gram sugar pack that we see in restaurant tables. 0.13ml (of Propofol) is equivalent to specks of sugar crystal in 1/MILLIONTH of that sugar pack. Starting from the Propofol. Why did you analyze it on 3 separate blood samples? Typically on positive drug analysis, we will actually perform on 2 separate blood samples. One being the central blood, the other being the peripheral blood. Central being the heart blood, the peripheral being away from the central cavity in the leg. You typically have to analyze them together because of what they call postmortem redistribution. Drugs are stored in tissues and fats. When u die, it has a tendency to release the drug back into sort-of circulation. You are not really circulating any blood when u die but it is available to move around artificially. So as the body gets moved, transported, taken from the cooler, it potentially can re-move high concentrations of drug into different areas that you wouldn’t have expected. That’s why you take two blood samples, both centrally and peripherally so that you can actually measure the difference in drug concentrations. In this case, we got a third blood sample. It was a hospital admission blood. It was like an icing on the cake, it was an extra specimen for us to look at. Hospital blood (for Propofol) is higher than the heart blood. Do you know why? The femoral blood is the lowest them all. Do you know why? I noticed that you have done Lidocaine in heart, hospital and femoral bloods, why didn’t you do it in the vitreous? Ephedrine is present in urine and urine scene but not detected in heart blood. Is it because bladder store things for days? Let’s assume hypothetically that the scene urine was deposited somewhere between 7:00 - 7:30am, time of death is somewhere between 12:00 2:26 and the autopsy urine was collected after time of death, that much urine would be collected after the initial time of death, wouldn’t it? That’s a lot of Lorazepam, isn’t it? Would u be able to relate that 0.162 or 0.169 in the femoral blood, would u be able to relate that to the milligrams of Lorazepam used? What assumptions do you have to have made? Judge: Have you engaged in this type of research or analysis or aware of the findings? Lorazepam is not subject to post mortem redistribution, is it? Do you have a PDR? 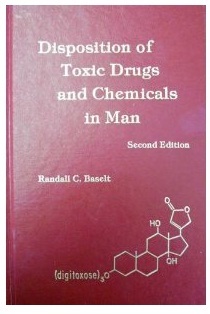 Are u familiar with a book written by Baselt? Is he an authority on drugs? From the measurement of Lorazepam, could you tell whether or not that Lorazepam was IV Lorazepam or a pill form? I noticed that there is no testing for a metabolite of Lorazepam, is that correct? By virtue of your testing, are you able to determine how long prior to time of death Lorazepam was consumed? Are you familiar with the half life of Lorazepam? What figure do you use for half life of Lorazepam? So that would mean that if a person has 0.162 in his system, it would take them about 9 to 16 hours to metabolize down to 0.08? Is half life the time it takes a drug to dissipate half of what is in your system? If Lorazepam was taken by way of injection, 2mg at 2 and 2mg at 5, how long would it take to get that out of your system? Do u know what level of Lorazepam you would start with before you star deducting for the half life? You tested for metabolite of Diazepam, is it your testimony today that there is not a metabolite for Lorazepam? So it is very difficult to test for, is it called Gluconride? Glucuronide. What happens is when you take Lorazepam, injected or tablet, your body will attack the Lorazepam and attach a large protein onto it, that is the Glucuronide. So analytically, what we intend to analyze for is the free portion of the Lorazepam, not the Lorazepam Glucuronide. It is not really a metabolite. It is a process. 0.162 and 0.169 pretty consistent, aren’t they? That has a tendency to indicate that Lorazepam is at equilibrium in the body? It takes time for the body to reach equilibrium, doesn’t it? Would that be consistent with Lorazepam being in the body for couple of hours? Heart, hospital, femoral, vitreous, those are not at equilibrium, is it? They are not equal but looking at those numbers, you cannot determine that the body is at equilibrium, can you? If the person has been on a drip, say for an hour, you would expect the body to be at equilibrium, wouldn’t you? I was talking about the body, we’ll get to the drip bag in a while. If a person was on a drip for an hour or so, that the blood levels, the vitreous, maybe in urine, everything would kind of reach equilibrium, wouldn’t it? The concentration of Lorazepam in stomach is 4 times higher than that of concentrations of femoral and heart blood, isn’t it? Do u think that is an important number? Isn’t that consistent with oral consumption of Lorazepam? JUST BECAUSE YOU ANALYZE THE STOMACH CONTENTS AND FIND A DRUG IN THE STOMACH CONETMTS DOESNT NECESSARILY MEAN IT IS ORAL ADMINSITATION. WE FIND PLENTY OF DRUGS IN PEOPLE’S SYSTEM, THEY SMOKE IT, THEY IV IT, what have you, AND YOU WILL FIND THE DRUG IN THE STOMACH AT SMALL LEVELS. IT IS A COMMON OCCURANCE KNOWN AS ION TRAPPING WHERE A DRUG CAN GET TRAPPED IN THE ACIDIC ENVIRONMENT OF YOUR STOMACH. Is lorazepam subject to ion tapping? 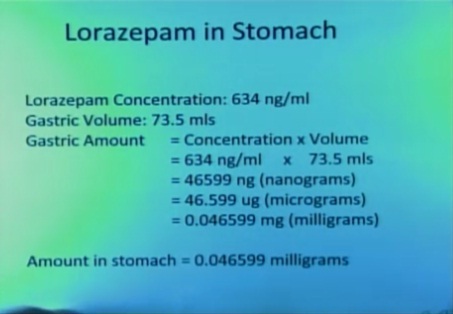 What was ur calculation of gross contents of Lorazepam in the stomach? The calculation that I performed? What is the equivalent of that in pills? Now Midazolam. You haven’t made the calculations as to the amount of IV Midazolam it would take to g4et to those levels, is that correct? That’s correct. The levels are negligible, they are actually very small. Would that indicate that if Midazolam was used earlier in the day, it is largely metabolized, would that be correct? Well if the evidence came out and it was established that that Midazolam was taken 2mg at 3 o’clock and 2mg at 7:30, would it be consistent with those figures? If we look at the urine test. The urine at the scene, of that plastic bottle that was captured from the scene, that is 0.025, is that correct? 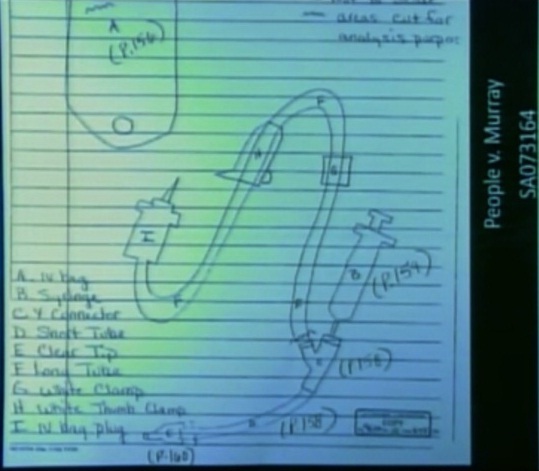 The IV bag from medical evidence #2, was it found to contain any drugs? Do u know whether or not the IV tubing was attached to that IV bag? Yesterday we were talking about equilibrium. I forgot to have you to define equilibrium as it relates to body fluids. Could you define that? Prescription of Lorazepam usually involves one 2mg pill, doesn’t it? I am gonna show you People’s Exhibit 107 which is a Lorazepam bottle. 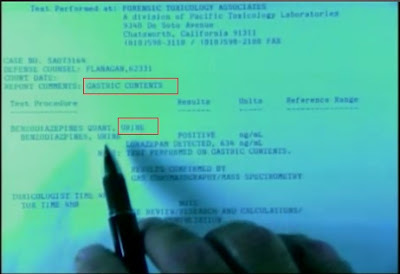 That is a prescription for Michael Jackson. What does it indicate that the prescribed amount is? You indicated yesterday that 0.16 level would indicate approximately 11mg? So that would be, maybe, 5 ½ of these pills or were your calculations related of IV? What’s the bioavailability of Lorazepam? You know what the term bioavailability means? So bioavailability of IV injection would be %100, wouldn’t it? And oral has got lower bioavailability, doesn’t it? You don’t know what that percentage factor is for Lorazepam? So it would take more pills to get to the same level than it would take, in terms of milligrams, it would take more milligrams by way of pill to get to the same level as IV, is that correct? To get 11mg in Michael Jackson’s body, how many pills would he have to….the level he had indicate that he had 11mg of Lorazepam in him, correct? If he were getting it IV, 11mg IV would achieve that number, isn’t that correct? So you’d have to take into consideration the time of dosing? What else other than time of dose and amount of dose, would you have to take into consideration? So u r not qualified to answer that question? R u comfortable with discussing ion tapping? Do you have a sense of it with respect to Lidocaine? Because u read Dr Shaffer’s report, is that correct? Wouldn’t it have a little bit difference from Propofol and Lidocaine in that Lorazepam is not subject to redistribution? So u wouldn’t know anything about Lorazepam and post mortem redistribution? But u would agree that a drug that is not subjected to postmortem redistribution is not going to be subject to ion trapping in the stomach? If a drug was subject to ion trapping in the stomach, and not subject to postmortem redistribution, you could take it orally, could you? Those two terms, ion trapping and post mortem redistribution, have NOTHING to do with each other. Well for ion trapping in the stomach, you have to have a way of getting the drug in the stomach, don’t you? And postmortem redistribution is one way of making it available, is that right? In order to get Lorazepam in the stomach, do you know of another way, other than postmortem redistribution or oral ingestion? And those were drugs that were subjected to postmortem redistribution, isn’t it? Do you have experience with a decedent having Lorazepam in the stomach that was not orally ingested? But you do have personal experience with other drugs being in the stomach that were not orally ingested? The other drugs that you measured, ephedrine being present in the urine would not be at a therapeutic level, would it? The diazepam, that is not at a therapeutic level, is it? It is therapeutic but it is not at a therapeutic quantity in the blood stream here, is it? The Midazolam, in the heart blood, 0.0046, that is not a therapeutic level, is it? I am beyond your expertise again? You came to a quick judgment that Propofol was the most important drug in this case, didn’t you? You didn’t do the calculations that u talked about today with regards to the 11mg (of Lorazepam) in stomach) until last weekend? Why did you do them then? 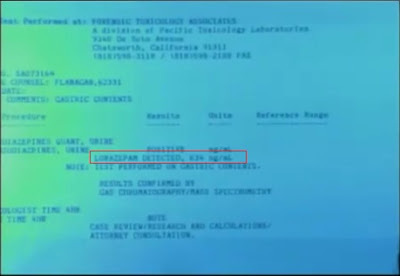 Were u also presented with the analysis that the defense did with Lorazepam in the urine samples? Did u do any special calculation for the purposes for determining what they meant? The why did you analyze the urine for Propofol and for Lidocaine? Why did u analyze the urine for Midazolam? So why did u do the urine for Midazolam? How does the urine values usually relate to Lorazepam? And they were in the results of the analysis that u seen done? Has your lab confirmed the analysis done by my lab? And the Lorazepam levels in the urine are much higher than the Midazolam levels, aren’t they? Lorazepam levels would be 13 point something in the scene urine and 15 point something in autopsy urine? Why don’t you find it? A lot more Lorazepam, isn’t it? So with respect to the urine at the scene, the Lorazepam level goes up in the urine sample at the autopsy, correct? And with respect to Midazolam, the autopsy urine concentration is much less, isn’t it? No, no, the urine sample Midazolam at autopsy is much less than the urine sample Midazolam at the scene? In the jug that was sitting on the chair, it is 4 times as much as it was at the time of autopsy? 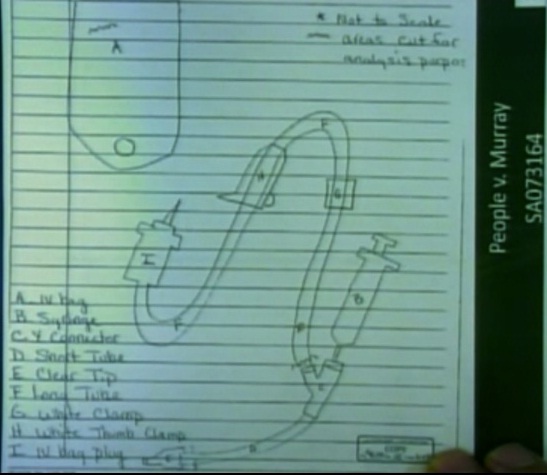 Whereas Lorazepam in the jug that was on the chair, it actually goes UP at the time of the autopsy? The half life of Midazolam, do u know that? But Lorazepam, you looked at the half life and that is 9 to 16 hours? 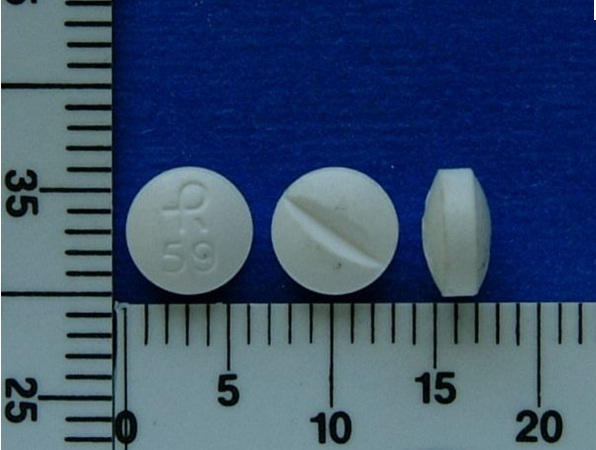 Would you be familiar with the fact that Midazolam has a shorter half life? When a person consumes Lorazepam orally, do u have any knowledge as to the time that it takes to get to the peak level? Where did you learn that the half life is 9 to 16 hours? Doesn’t Dr. Baselt’s book also indicate the time to reach peak level also? From the toxicology point of view when you are determining the numbers that you reference, could you please explain the difference between a blood sample and the urine sample as to the value it has in your analysis? So the urine is more historical in nature, it is what has been expelled from the body possibly over a period of time? Counsel represented this is a gastric contents result although it indicates urine. For the sake of my questioning, let’s just assume that it is gastric contents as indicated here. Let’s assume that this is 634ng/ml in the gastric contents for Lorazepam, you had a chance to review that? Did u work thru some calculations to break that number down into a meaning as it relates to tablets? What is the difference between concentration and total amount? Concentration is the amount per unit, in our case the Lorazepam in defense lab result measured Lorazepam from a sample unit of 1 MILLILITER. To find the TOTAL AMOUNT of Lorazapen in stomach contents, we need to multiply that amount with the amount of stomach content. Propofol you just don’t have the expertise to correlate its excretion into the urine with respect to how much was in blood? You wouldn’t be able to give us a timing estimate either? Judge: Is it beyond your area of expertise? By looking at the urine results and comparing it with the blood results, you can predict whether the substance was taken at a point in time close enough that the body hasn’t had a chance to come into equilibrium, can’t you? So but if there is nothing in the blood, there is some in the urine, it means it is taken a long time ago but if it is high in the blood and nothing in the urine, it means it is taken very recently, the drug, doesn’t it? When u did the gross calculations of milligrams of Lorazepam contained in the stomach, is it something Mr. Walgren asked you to do? In the event that a person were to take, say 7 or 8 tablets of Lorazepam and you were to analyze the stomach contents and you found 16mg of Lorazepam in the stomach, you would know that it was just taken, wouldn’t you? (blogger- Michael Flanagan asked series of questions in an attempt to imply oral administration of Lorazepam close to the time of death. Prosecution objected consecutively. Judge sustained consecutively. The witness stated that it was not his area of expertise and that he would rather have a pharmacologist testify to these questions. Finally the judge said “we are gonna have to move another subject, Mr. Flanagan”.